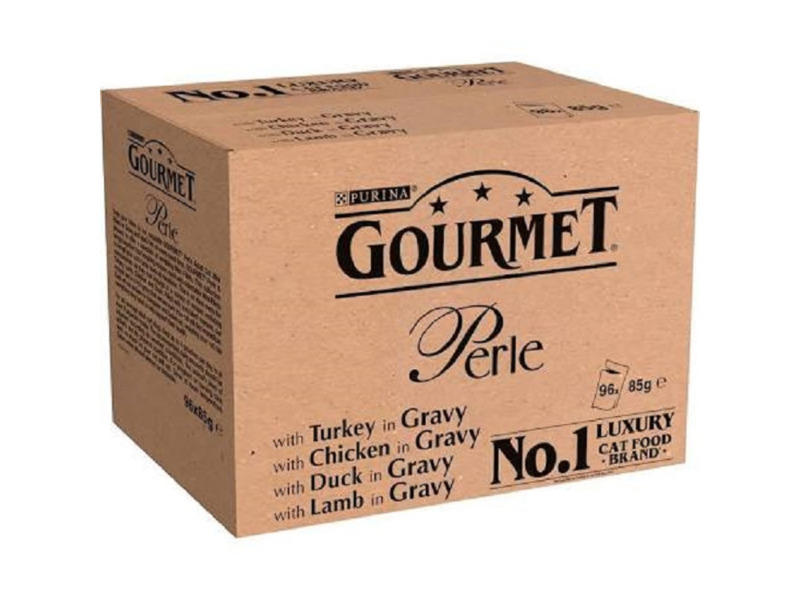 Gourmet Perle are a range of complete cat foods that have been specially prepared by the Gourmet chef. They contain premium quality ingredients and are suited to cats who prefer the finer things in life! The meats used are the finest, most delicate cuts and are cut into fine fillets. They are then either grilled or cooked in delicious sauces to enhance the flavour. There are a range of flavours to choose from to provide your cat with a variety that she will be sure to love. Meat and animal derivatives (of which turkey 4%), vegetable protein extracts, fish and fish derivatives, minerals, various sugars. Meat and animal derivatives, vegetable protein extracts, fish and fish derivatives (tuna 4%), minerals, various sugars. Meat and animal derivatives (of which duck 4%), vegetable protein extracts, fish and fish derivatives, minerals, various sugars. Meat and animal derivatives (of which lamb 4%), vegetable protein extracts, fish and fish derivatives, minerals, various sugars. Meat and animal derivatives (of which beef 4%), vegetable protein extracts, fish and fish derivatives, minerals, various sugars. Meat and animal derivatives (of which chicken 4%), vegetable protein extracts, fish and fish derivatives, minerals, various sugars. Meat and animal derivatives (of which rabbit 4%), vegetable protein extracts, fish and fish derivatives, minerals, various sugars. Meat and animal derivatives, vegetable protein extracts, fish and fish derivatives (of which salmon 4%), minerals, various sugars. Meat and animal derivatives, vegetable protein extracts, fish and fish derivatives (of which trout 4%), minerals, various sugars. Meat and animal derivatives (of which game 4%), vegetable protein extracts, fish and fish derivatives, minerals, various sugars. Meat and animal derivatives (meat 14%, of which chicken 4%, beef 4%), vegetable protein extracts, fish and fish derivatives, minerals, various sugars. Meat and animal derivatives (meat 14%, of which turkey 4%, lamb 4%), vegetable protein extracts, fish and fish derivatives, minerals, various sugars. Meat and animal derivatives (meat 14%, of which duck 4%, liver 4%), vegetable protein extracts, fish and fish derivatives, minerals, various sugars. Meat and animal derivatives (meat 14%, of which rabbit 4%, game 4%), vegetable protein extracts, fish and fish derivatives, minerals, various sugars. Meat and animal derivatives, vegetable protein extracts, fish and fish derivatives (salmon 4%), molluscs and crustaceans (whole shrimp 4%), minerals, various sugars. Meat and animal derivatives, vegetable protein extracts, fish and fish derivatives (tuna 4%), molluscs and crustaceans (whole shrimp 4%), minerals, various sugars. Meat and animal derivatives, vegetable protein extracts, fish and fish derivatives (ocean fish 4%), molluscs and crustaceans (whole shrimp 4%), minerals, various sugars. Meat and animal derivatives, vegetable protein extracts, fish and fish derivatives (plaice 4%), molluscs and crustaceans (whole shrimp 4%), minerals, various sugars. Meat and animal derivatives, vegetable protein extracts, fish and fish derivatives (of which salmon 4%, pollack 4%), minerals, various sugars. Meat and animal derivatives, vegetable protein extracts, fish and fish derivatives (ocean fish 4%, tuna 4%), minerals, various sugars. Meat and animal derivatives, vegetable protein extracts, fish and fish derivatives (salmon 4%, white fish 4%), minerals, various sugars. Meat and animal derivatives, vegetable protein extracts, fish and fish derivatives (sardine 4%, tuna 4%), minerals, various sugars. mg/kg: Fe(E1): 9; I(E2): 0.2; Cu (E4):0.7; Mn(E5): 1.7; Zn(E6): 8.9.
mg/kg: Fe(E1):10; I(E2): 0.3; Cu (E4):0.9; Mn(E5):2.0; Zn(E6):10. For an average size cat (3.5kg) the daily feeding amount is 3 pouches per day divided between at least 2 meals. There are currently no questions for Gourmet Perle Cat Food - be the first to ask one!